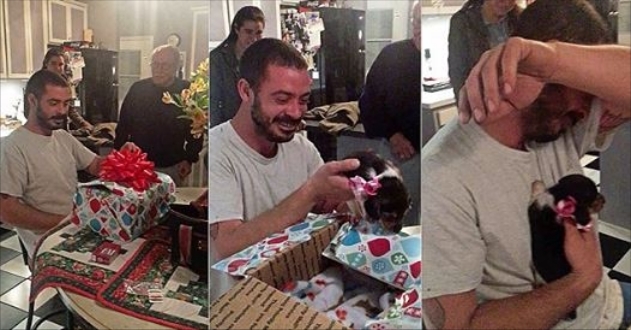 A marine suffering from Post-Traumatic Stress Disorder (PTSD) was left sobbing with happiness when his family gave him a puppy as an early Christmas present. Peter Coukoulis, 26, of Tallahassee in Florida, was given a Beagle by his mother, Dena. In the video, Peter sits in the kitchen at home, with family gathered all around him. Its not until a neatly wrapped mystery box is placed in front of him that he realises all the commotion might just be for him. He looks down smiling and laughing at the box, but as he opens the lid to see an adorable beagle puppy inside, Peter begins to weep uncontrollable tears of joy as he clutches and kisses the minute pup, in a truly heart-warming moment of embrace. He has been suffering with PTSD after returning to civilian life three years ago. Dena said: 'The puppy has already changed Peter's life, it has made him happy after a very difficult three years. 'I knew the beagle was the missing void. 'There have been so many occasions where I've seen him so incredibly sad with no sense of self-worth or purpose. Responses to "Marine Veteran with PTSD is sobbing when he receives a puppy"
Wonderful Person. Thank you for your service. You are NEVER forgotten ! Wonderful Gift ..Have a wonderful xmas.! !